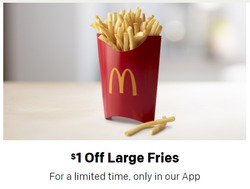 Offer valid thru 4/28/19 at Participating McDonald's. Valid 1x/Day. See McD App For Details. 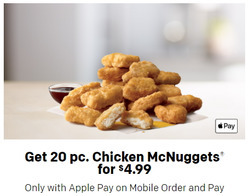 Mobile Order & Pay At Participating McDonald's. McD App download and registration required.©2019 McDonald’s. It originally began as a barbeque restaurant, but has since transformed into selling primarily McDonald’s hamburgers, cheeseburgers, chicken, French fries, breakfast, and soft drinks. They have recently expanded their menu by adding salads, fish, fruit, and smoothies to the menu. 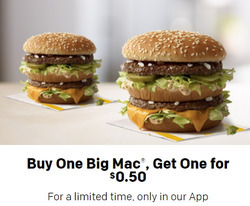 Do you want to receive more deals from McDonald's by email?